Harry Kane is the odds-on favorite in the Anytime Goalscorer market ahead of the Tottenham vs Manchester UTD match at Wembley Stadium this Wednesday night. Fancy the "Hurricane" to find the net against the Red Devils? Join GentingBet and get an enhanced price! Claim 5/1 Harry Kane to score a goal (instead of 5/4). Max bet £10! Paid in cash! Harry Kane has been in blistering form once again this season, racking up 21 goals so far in the Premier League (10 in Spurs’ last eight Premier League outings at Wembley) and reaching the 30-goal mark in all competitions last weekend. The English international will be desperate to add to his solitary strike versus Man UTD and net his 100th top flight goal in the process. Find below how to get 5/1 for Harry Kane to score during the match! 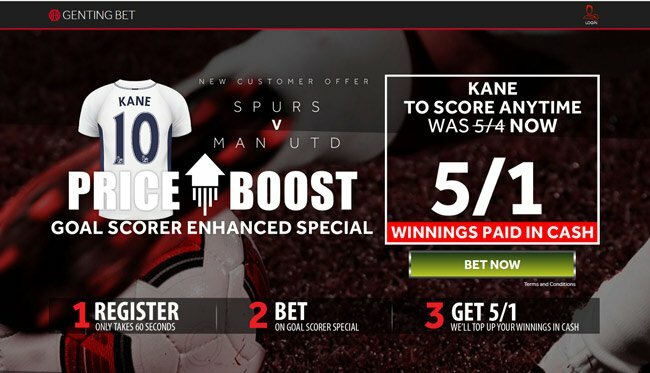 Join Genting via our special links and claim 5/1 on Harry Kane to score! 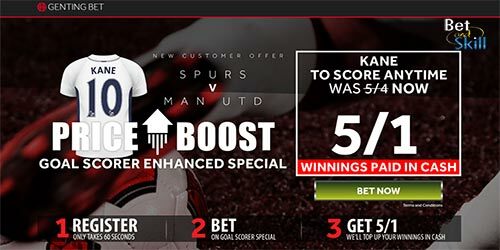 3) Place a single bet of up to €/£10 on Harry Kane to score at normal odds in the Spurs v Man UTD anytime goalscorer market before the kick off. 4) If your bet wins, your account will be credited with extra winning to make payout equivalent to enhanced odds within 24 hours. Winnings will be paid in cash! GentingBet was launched in October 2013 and is part of the Genting Group. The company has 45 years of gaming expertise running some of the most popular casinos and resorts in Malaysia, Singapore, Australia, the Philippines and here in the UK, with over 58,000 employees around the world in casinos, resorts and online ventures. GentingBet is licensed and regulated by the UK gambling commission and the website is available on your PC and also your mobile devices. New customers can alternatively claim a different welcome bonus. 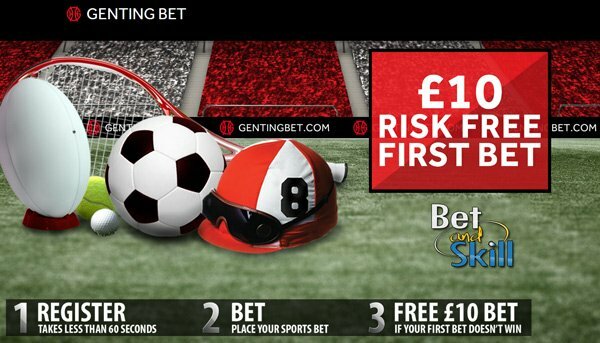 Genting Bet are offering a £10 risk-free first bet! A real insurance on your first attempt to bash the bookmaker! Offer available to new customers aged 18 or over, registering via this page. Only pre-match single bets (both from desktop and mobile) qualify for the enhanced price. Maximum bet is £10. Exceeding stake will not be counted. Winnings paid in CASH withing 48 hours of your qualifying bet settling. Full terms & conditions apply. begambleaware.org. "Genting offer 5/1 Harry Kane to score vs Man UTD (was 5/4)"